The other day, I was looking through my family tree to see how far back I could go to see who passed down the mitochondrial DNA haplogroup HV0 that I have. I only got as far back as Alice Moore, my maternal 5th great grandmother. Just about all I knew about her before writing this post was that she was born around 1756, married my 5th great grandfather John Thompson Lawson (a Revolutionary War soldier) in 1777, and died in 1798. In doing some research for this post, I found that her father may have been Charles Moore who was born around 1727 and was Scots-Irish from Ulster, Ireland. When Charles came to America, he may have lived in one of the mid-Atlantic states before eventually heading south and settling his family in what is now Spartanburg County, South Carolina. Alice's mother was named Mary. Some family trees on ancestry.com say she was Mary Margaret Hamilton and some say she was Mary Barry. There seems to be several connections between the Moore, Barry, and Lawson families. Also, Alice's sister Margaret Catherine married a Barry. One of Alice's daughters is named Mary Barry, and her great granddaughter (my maternal 2nd great grandmother) was named Mary Barry Wyche. 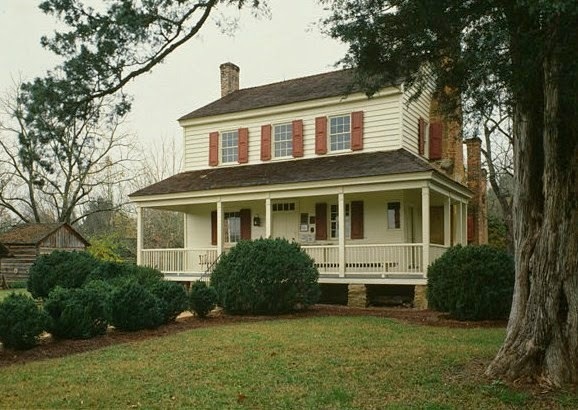 Charles and Mary built Walnut Grove Plantation in Spartanburg County in 1765, so this is probably where Alice grew up. The Moores actively aided the Patriots during the Revolutionary War and allowed the militia to muster at their plantation. 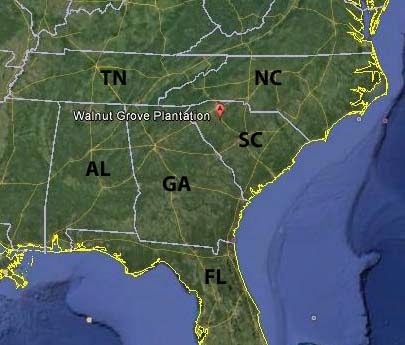 Location of Walnut Grove Plantation in Spartanburg County in northwestern South Carolina (Aerial from Google Earth). Walnut Grove Plantation home of Charles and Mary Moore in Spartanburg County, South Carolina (Wikipedia Commons from the Historic American Buildings Survey, National Park Service). After Alice married John Lawson, they moved to Georgia. They had at least seven children: Charles, Hugh Thompson, Roger, Hannah Thompson (my 4th great grandmother), Mary Barry, Violet, and Alice Margaret. They may have lived in Twiggs or Warren counties. Folks Huxford, in his Pioneers of Wiregrass Georgia, notes that John was a prominent citizen of Jefferson County. Jefferson and Warren counties are next to each other. Twiggs is further to the southwest near Macon, Georgia. 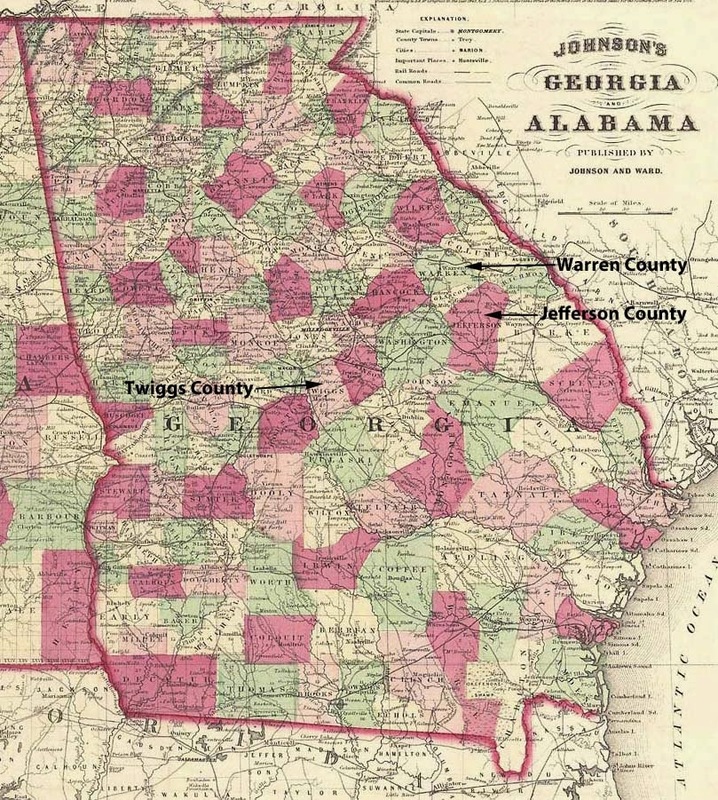 Below is an 1863 Georgia map that I've labeled showing the locations of these counties (A. J. Johnson's map of Alabama and Georgia, http://georgiainfo.galileo.usg.edu/histcountymaps/ga1863map.htm). They could have ended up in Twiggs, which is where their daughter Hannah died in 1842. I wonder if Alice and her husband John were cousins. John's great grandfather was named Charles Moore. Alice's grandfather was also named Charles Moore. I tried following this trail for a while but the name Charles Moore is fairly common, and I haven't found if these Charles Moores are related. What a tangled web! Now, off to learn about the Scots-Irish from Ulster! Mrs. James W. Fant. National Register of Historic Places Inventory - Nomination Form for Walnut Grove Plantation, May 16, 1970. Electronic document, "Walnut Grove Plantation", accessed March 16, 2014. Folks Huxford, Pioneers of Wiregrass Georgia, Volume 5. Self published, Homerville, Georgia, 1948, 309.